Alexander Roslin, Carl von Linné 1707-1778, 1775. Nationalmuseum, Stockholm. On a recent visit to Sweden, my wife Nancy and I went to the lovely university city of Uppsala. There, one of the highlights of our trip was a tour of the house and garden of the great 18th century botanist, Carl Linnaeus, who invented the system of naming plants and animals we use today. 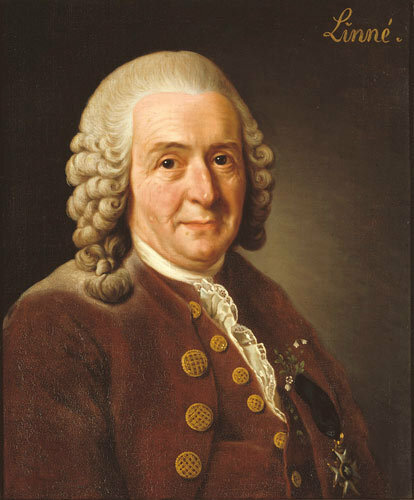 Whenever we say Homo Sapiens, for example, we are honoring Linnaeus. His system uses two Latin words, first the genus and then the species. This replaced long, descriptive, but non-standardized naming systems that made it difficult to work out the relationships among plants and animals. Linnaeus was the most famous botanist of his time, and he is generally considered the most famous botanist in all of history. He wrote hundreds of books and papers, and he inspired the work of generations of botanists and biologists to follow, right up to today. But he was dead wrong. What Linnaeus was primarily trying to do was to create a comprehensive system to organize plants by their characteristics. In this, he developed what he called a "sexual system," emphasizing the means by which plants reproduce. This was a reasonable guess, but later research showed that his organization system was incorrect. But the fact that his specific model was wrong does not subtract one mustard seed from the power and importance of Linnaeus' contribution. Linnaeus' lasting contribution was in his systematic approach, carefully analyzing plants to observe similarities and differences. Before Linnaeus, botany involved discovery, description, and categorization of plants, but there was no overarching system of relationships, and no scientifically useful naming system to facilitate seeing relationships. The life and work of Linnaeus provides an interesting case for educators and educational research. Being wrong is not shameful, as long as you can learn from your errors. In the history of education, the great majority of research began with a set of assumptions, but research methods did not adequately test these assumptions. There was an old saying that all educational research was "doomed to success." As a result, we had little ability to tell when theories or methods were truly impactful, and when they were not. For this reason, it was rarely possible to learn from errors, or even from apparent successes. In recent years, the rise of experimental research, in real schools over real periods of time measured by real assessments, has produced a growing set of proven replicable programs, and this is crucial for improving practice right now. But in the longer run, using methods that also identify failures or incorrect or unrealistic ideas is just as important. In the absence of methods that can disconfirm current beliefs, nothing ever changes. It is becoming apparent that most large-scale randomized experiments in education fail to produce statistically significant outcomes on achievement. We can celebrate and replicate those that do make a significant difference in students' learning, but we can also learn from those that do not. Often, studies find no difference overall but do find positive effects for particular subgroups, or when particular forms of a program are used, or when implementation meets a high standard. These after-the-fact findings provide clues, not proof, but if researchers use the lessons from a non-significant experiment in a new study and find that under well-specified conditions the treatment is effective for improving learning, then we've made a great advance. It is important to set up experiments so that they can tell us more than "yes/no" but can instead tell us what factors did or did not contribute to positive impacts. This information is crucial whatever the overall impacts may be. In every field that uses experiments, failures to find positive effects are common. Our task is to plan for this and learn from our own failures as well as successes. Like Linnaeus, we will make progress by learning from "brilliant errors." Linnaeus' methods created the means of disconfirming his own taxonomy system. His taxonomy was indeed overthrown by later work, but his insistence on observation, categorization, and systematization, the very methods that undermined his own system of relationships among plants and animals, were his real contribution. In educational research, we must learn to celebrate high-quality rigorous research that finds what does not work, and include sufficient qualitative methods to help us learn how and why educational programs either work or do not work for children. May we all have opportunities to fail as brilliantly as Linnaeus did!